These days vegetarianism is very popular. So why, when we are faced with the prospect of putting on a vegetarian dinner party are we sent into a blind panic? Relax. Let us allay your fears and help you to host the best dinner party of your lives. One of your main concerns about hosting a vegetarian dinner party is that the outcome might be bland, boring and insubstantial. The last thing you want your guests to do is to leave your dinner party and head to the nearest takeaway restaurant for a "real" meal. However, these days such thinking can be confined to the cooking history books. There is a solution that will get everyone's taste buds going and best of all; it's not as difficult as you may think. This is one of the easiest types of cuisine to adapt to vegetarian flavours. A simple starter of Insalata Tricolore, avocado, mozzarella and tomato with a drizzle of herbed olive oil can be married with a main course of pasta in a tomato based sauce, with roasted vegetables. This is both easy to prepare and delicious. Dessert can be almost anything from calorific tiramisu, sweet pine nut tart or a light, fruity granita, the latter a good choice in the summer months. Japanese food is more than just sushi. Fish is one of their staple diet ingredients but this can easily be substituted to accommodate the strictest of vegetarians. Miso soup, bulked out with wakame seaweed, chopped spring onions and small cubes of tofu is a refreshing and light starter. Follow with some vegetarian sushi rolls. All you need are sheets of seaweed, some sticky sushi rice, and a choice of filling. Avocado, cucumber and sweet potato are all good options. If you want to have a hot side dish, purchase some tempura batter and deep-fry any vegetable you like. Peppers, carrots and even broccoli can be transformed into hearty tempura. Serve up fresh fruit for dessert and round off the evening with some hot sake. 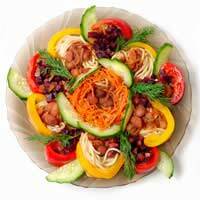 Middle Eastern food is full of pulses, beans and spices, making it the perfect vegetarian cuisine. It is also a very sociable type of cuisine, frequently involving the sharing of dishes, making it perfect for an informal gathering. Start simply with hot pita bread and homemade hummus (all you need is chickpeas, olive oil and lemon juice). Sides of artichokes, and three-bean salad can accompany a main course of koshari, a mix of lentils, rice, spicy tomato sauce, onions and garlic. For dessert, sticky Middle Eastern pastries like baklava will round off the meal perfectly. Few people can resist a delicious Thai curry. Take our advice and serve up a mild coconut curry, with tofu and side dishes of green beans and basmati rice. The great thing about this warming menu is that it is also vegan, so the most fervent of vegetarians will be fully satisfied. Follow the main course with a soothing dessert like exotic fruits with an optional side of coconut ice cream. As you can see vegetarian food is incredibly varied and delicious so don't worry if you are about to host your first vegetarian dinner party. The fact is that there are so many delicious menu choices. Whatever the theme of your dinner party, there will be a menu out there to suit.